The shocking thing about the video of a yacht being capsized while entering harbour is that it shows it being knocked flat by a relatively small wave – but a breaking one. This is the type of wave that we should all fear. You can see that as the swell is funnelled into the shoaling entrance of the harbour at Zumaia in northern Spain a wave begins to crest and then break, and the dynamic energy capsizes the boat. Alarmingly, you can see several of the crew are washed overboard. There have been many examples of yachts making landfall, sometimes to seek shelter, only to find themselves in graver danger on the harbour approach. In 2012, Australian Mini Transat sailor Katrina Ham’s yacht was rolled while under tow entering the harbour at Ribadeo in northern Spain. The boat was subsequently smashed up on the rocks and was a total loss. 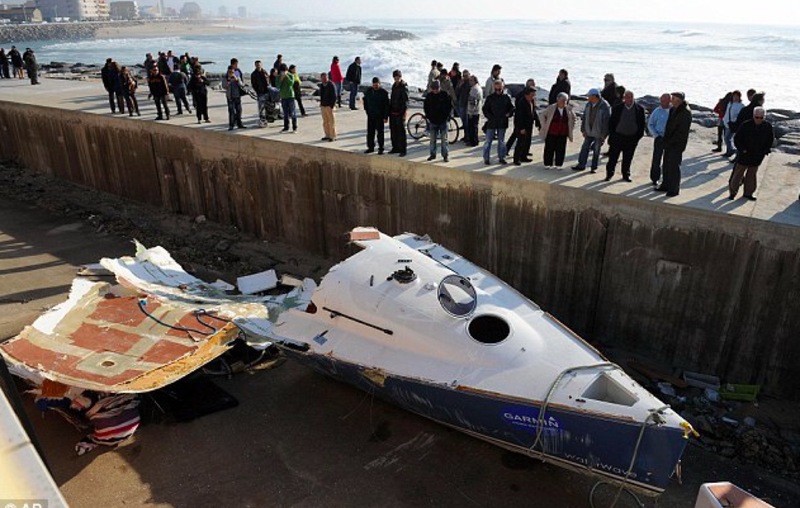 It also brings to mind the tragedy in 2012 when two British sailors were killed when their yacht (pictured below) was capsized and torn asunder by the power of a breaking wave while entering the harbour of Povoa de Varzim harbour near Porto. The wreckage is shown below. We often think of the size and steepness of waves as being the deciding factor in capsize (along with a vessel’s inherent stability characteristics). But research suggests that the most significant factor is whether a wave is breaking or not. No matter the strength of the wind, the wave height or its steepness, it only takes a breaker to knock a boat over – and that wave does not need to be very large. Research a decade or so ago by the Wolfson Unit at University of Southampton University concluded that for a 10m yacht, ‘you only need a breaking wave of 3m to pose a risk of capsize’. Various types of boat and keel type were tested. A wave height of 60 per cent of the boat’s length capsized all the models they tested. So just to spell this out, a 32-footer would almost certainly be capsized a breaking wave with a height of as little as 20ft. Knockdowns to 90° are bad enough, but of course breaking seas also have the power to invert a yacht, as has often been proven. At that point the stability characteristics of a yacht do have a decisive bearing on the readiness with which a boat rights herself – but that’s a huge other subject in itself. Another big topic is the efficacy of techniques such as trailing warps or drogues, plus the problems of deployment and retrieval. That’s a really interesting (and somewhat controversial) subject. It’s also a topic in our great Skip Novak’s Storm Series – read what Skip has to say about using drogues here. It’s a don’t miss subject for anyone with serious world-girdling or long-distance sailing plans. You can catch up with videos of our Storm Series to date on the Yachting World homepage or on Yachting World’s YouTube channel.